August, 2014 | Sports Medicine Dr.
Dr. Stetson recently traveled to Costa Rica on behalf of Orthopaedics Overseas and in association with Operation Arthroscopy, a non-profit organization that he founded with his wife. The mission of Operation Arthroscopy is to “bring orthopedics and arthroscopy to a world in need.” During his time in Costa Rica, Dr. Stetson worked with Dr. Fernando Contreras pictured here on the left and his anesthesiologist (on the right) to bring new shoulder arthroscopy equipment and skills to the people of Costa Rica. If you have any interest in contributing to this cause, please contact Stetson Powell Orthopedics via phone, 818) 848-3030 or email to business manager Scott DiCesare at scott@stetsonpowell.com. Dr. Powell, Dr. Stetson and Dr. Pietro Tonino from Loyola Chicago taught an Instructional Course Lecture on “Volunteerism in Your Orthopedic Practice” at the 33rd annual Arthroscopy Association of North America (AANA) meeting May 1 – 3 in Hollywood, Florida. The course enabled fellow orthopedics surgeons to gain skills necessary to make a difference both in their local communities and overseas. Dr. Stetson spoke about his non-profit Operation Arthroscopy while Dr. Powell shared his experience establishing the MusiCares Medical Network which provides free care to musicians who do not have health insurance. Volunteer Saturday is a branch of Operation Arthroscopy that provides orthopedic and arthroscopic surgical care to patients who are unable to afford such procedures. On Saturday, April 12th, Dr. Stetson and his team at Glendale Endoscopy and Surgery Center volunteered their time, knowledge and equipment to perform two arthroscopic surgeries. 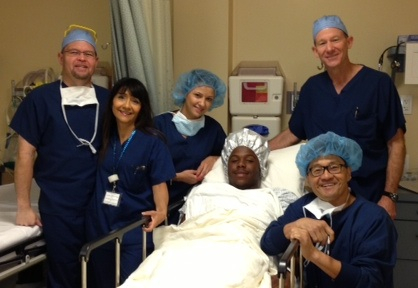 Pictured here is Monrovia High School star football player and running back Darione Jones. Hope to see you back out on the field doing what you love, Darione! A special thank you goes out to all of the volunteers as well as the companies who kindly donated supplies, including Smith & Nephew. Volunteer Saturday was featured in The American Orthopaedic Society for Sports Medicine’s current issue of Sports Medicine Update in an article written by our pre-medical intern Nicole Goldhaber. Dr. Stetson travels to Bulgaria with the U.S. Men’s National Volleyball Team as they start their 2014 World League summer season! 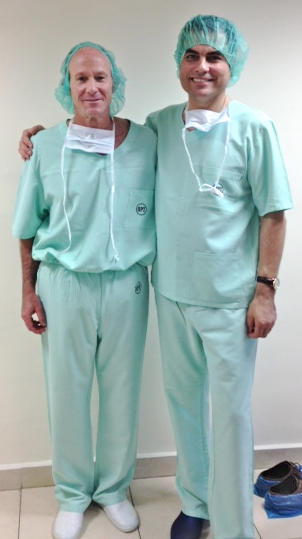 Dr. Stetson is pictured with Dr. Plamen Kinov of the Bulgarian Orthopaedic Society on his recent visit to Varna, Bulgaria on May 22 – 25. Dr. Stetson visited the University “Hospital St. Marina” to discuss future educational programs as part of his duties as Chairman of the AAOS International Committee. The goal of the AAOS International Committee is to “globalize orthopaedic education” and bring it to all countries including those that cannot afford it. Copyright © 2010 Sports Medicine Dr. All Rights Reserved.